Can we put the “Bryce Harper will make the team” stories to rest? Davey Johnson inadvertently has started a storyline that just won’t go to bed; by saying that he wants Bryce Harper to break camp with the 25-man team, national writers and local beat reporters keep reporting about the possibility of Harper playing RF for the team on opening day. If Harper starts the season with the big league club, then he reaches Free Agency one year earlier. If Harper joins the big league club after mid April but before mid-to-late June, then the financial penalties to the club are severe. In case you weren’t aware of these two issues, lets discuss. 1. Reaching Free Agency a year early: See this excellent Service Time Consideration post from Ben Nicholson-Smith at mlbtraderumors.com. Simply put, if the Nats start Harper with the big league club as of April 1st, then he will be eligible for free agency at the end of the 2017 season. If we wait a few weeks, then that buys the club an entire extra season of Harper’s time for the 2018 season. As has been put simply by other writers, a few weeks of Harper’s rookie season at age 19 is absolutely not going to be worth the value he will provide to the team during an entire 2018 season, by which point he looks to have many full seasons of experience and should be nearing his baseball peak at age 25. 2. Super 2 Status implications: As we should all know by now, the financial implications of bringing up super stars too early can be severe. Dave Sheinin did this analysis best back when we were asking the same question about Stephen Strasburg, looking at the Tim Lincecum case as a lesson learned. The Giants called up Lincecum about two weeks prior to the Super-2 status deadline and it has roughly cost them $18million in unneeded salary. 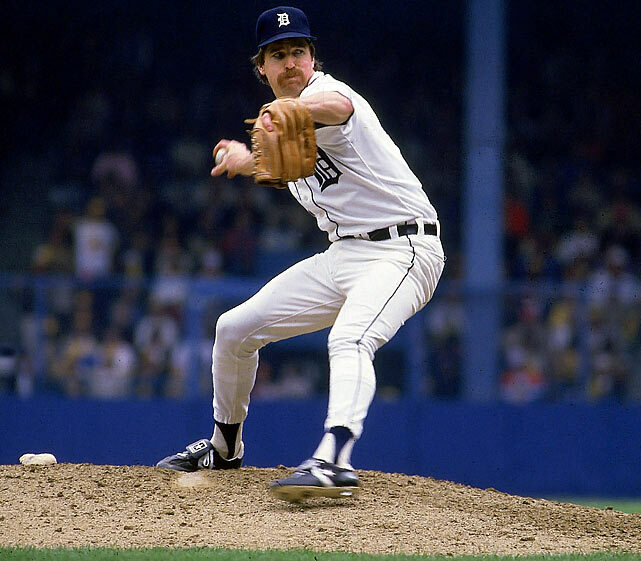 Lots has been said about how Davey Johnson broke camp with two young superstars in Dwight Gooden and Daryl Strawberry during his time with the Mets in the mid 1980s, with the narrative being that he’s not afraid to give young players a shot early. That’s a great story but it omits one key point: the Super-2 status didn’t exist when Johnson made these decisions! The Super-2 status didn’t exist in the Collective Bargaining Agreement until 1990, when the players negotiated in the status as a way of getting more money earlier to their union members. A great idea at the time, but it has had the unintended effect of teams now keeping their best prospects in the minors until the mid-June time-frame as a way of gaming the system and keeping their pay low. Frankly, I’m tired of reading stories about Harper that don’t at least tacitly acknowledge these two important points, and to me any story that talks of Harper making the team blindly without addressing these two modern baseball issues is lazy sports writing. Johnson may want the guy now, but Mike Rizzo is the guy who has to answer to fans as to why the Nats won’t be able to get a free agent in 3 year’s time because of the payroll implications (upwards of $18M in some cases) of screwing up these decisions. $18M in payroll generally buys you two starting players on the free agency market, and those two players can make the difference far more than a few weeks of Harper hitting .200 as a 19-yr old. Honestly, everyone thought that this issue would have been addressed in the latest version of the CBA, negotiated ad-naseum over the past off season. The clause helps no one; players are kept in the minors longer to game the system, teams have to wait to bring up players that could help them win now, and fans are forced to wait to see the best young stars. Instead the two sides managed to make the situation WORSE, by increasing the percentage of players that qualify for Super-2 and now forcing teams to keep players in the minors even longer. It was an inexplicable decision by both sides to further exacerbate the problem. I realize that no matter what you do, there has to be a cutoff date for service time deadlines to qualify for free agency and/or super-2 status, but why no just make that date early in the season and fix all the problems caused by super-2? As a fan of the team this season, yeah I’d love to see Harper up and starting in RF. Who wouldn’t? But as a long term fan, I want this team to have the best chance of winning for years to come. And thus I want Harper in the minors until these two issues are non-issues any longer. 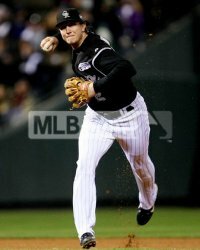 If you had to pick one player to start a team with ... you can't do much better than Tulowitzki. Photo unknown via facebook page. With the Redskins losing games faster than the GOP loses presidential candidates, Tom Boswell did his weekly Monday chat on 11/21/11. He did take a ton of baseball questions; here’s how I’d have answered them. As always, questions are edited for clarity and I answer here prior to reading his. Q: Boz, If you pick any current baseball player (assuming current ages) to start a team with who would it be? A: Great question. I’d probably go with a position player over a pitcher, just for risk’s sake. Has to be a young, already productive player. I’d focus on a marquee position that generally is difficult to fill. I’d probably go with Troy Tulowitzki. Also in the mix would be Matt Kemp, Ryan Braun, Jacoby Ellsbury, Evan Longoria, Felix Hernandez and Clayton Kershaw. These are all guys who are in their mid-20s and who have already proven they are accomplished, MVP/Cy Young calibre players. Boswell never answered. Q: How is MLB going to come up with the 2013 schedule, with 15/15 team-league splits, constant interleague play and balanced opponents? 6 home/6 away against 4 divisional rivals = 48 games. That leaves 48 games to play. 48 games is 16 3-game series. That doesn’t really work out too well for 15-team leagues. Do you play every AL team once and double up somewhere? Do you focus on playing a home/away series with each of a 5-team AL division on a rotating basis? That would take away 10 of the 16 series but you still have 18 games to figure out. And, what happens when your rotating division ends up being the same as your Natural rival? Then you either play them as many times as you play your divisional rivals or you double up elsewhere. Frankly, I think the unbalanced schedule needs to stay, if only to emphasize divisional rivalries. If you increase divisional games to 9 home/9 away then you have 72 games accounted for intra-division. Take away 60 regular season games intra-league and your 6-game set versus your “natural opponent” you’re left with exactly 24 games. That’s 8 three-game series, which still isn’t an even number but could be handled with a team playing an entire AL division (splitting home and away) and parts of another. I don’t know; there’s no real clean solution that makes itself evident. Boswell also says he has no idea how the schedule will work. 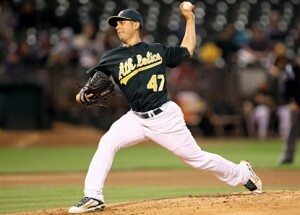 Q: Better Pitcher for the Nats – Oswalt or Buerhle? A: I’d rather have Oswalt frankly. Buehrle may be an innings eater but Oswalt is a better pitcher, an “Ace” without question just within the last couple of seasons. I don’t want a #3 starter; I want a guy to join my two best arms and give me something approaching a playoff rotation. Caveat; I have to be sure Oswalt is healthy. Does he have too many innings on that arm? Is he recovered from his back injury? The Nats are clearly favoring Buehrle right now, an indication that either they don’t trust Oswalt’s injury or they perceive that Oswalt wants to return to Texas. Boswell doesn’t really answer, just noting that Buehrle throws about as hard as Milone. Q: So who do you think we have in CF starting next year? A: Someone that we either sign or acquire from outside the organization. The easy guess would be BJ Upton, but a couple things have to happen before that happens. There’s a few other interesting options that could serve as another 1 year hold-over til we figure things out. I don’t see the team depending on Werth in center full time. Ankiel was excellent defensively but was awful at the plate and the team should go in a different direction. Boswell goes with Upton, after a non-tender. Q: Boz – Rizzo makes numerous references to the Nats being open to trades. The team is in the unique position of having a surplus of young talent. Who do you think are the untouchables and who are the prospects that we may never see play in a Nats uniform because they were traded away? A: Untouchables: Harper, Strasburg, Espinosa, Zimmerman, Rendon, Purke, Cole, Goodwin, Meyer, Norris, Peacock. Potentially in play for trades: Storen, Clippard, Solis, Ray, Desmond, Hood, Marrero, Detwiler, Lannan and pretty much anyone else. 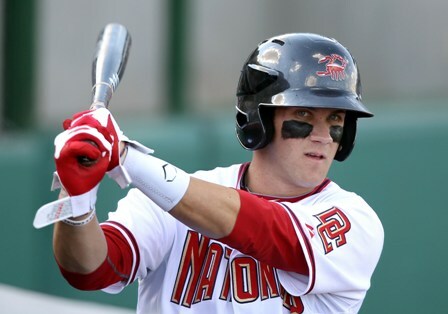 Prospects we may never see in a Nats uniform? That’s a harder question to guess on. There’s certainly guys who seem blocked in a certain extent, but I’m guessing we trade MLB talent to unblock them before we trade them as prospects. The team has come too far with its farm system to just throw away the fruits of it. Boswell agrees mostly; he’s too busy using these questions as a forum to trash the Redskins. Q: So do you think there is a chance that they sign Zim to a long term contract now or are we in danger of him going to free agency? I don’t want to see him in a Yankees/Phillies uniform. A: This is a better question for NEXT off-season. However if I’m Rizzo, and Zimmerman spends another couple months on the DL this season with some random injury, I’m really, really hesitant to give him a Troy Tulowitzki/Ryan Braun type of extension. I may just allow him to leave or trade him mid 2013 (assuming the team isn’t in 1st place at the time). By the way, he’ll never play for the Yankees; they have roughly $170M locked up in Alex Rodriguez‘s aging bat for the next decade. Phillies? I don’t think they have much in the way of payroll flexibility in the 2013 timeframe. A real possibility is Boston; i have a future blog post detailing the scenario they could find themselves in sooner than later. Boswell says they can, and should do the deal, despite the risks b/c he may be a lot more expensive next off-season. Q: If you were starting an MLB team today, who would you want as your ace? Clayton Kershaw or Stephen Strasburg? Kershaw already has a Cy Young yet is only four months older than Strasburg. A: I call this the Jason Amos question, my LA Dodger following friend who posed this same question to us earlier this season. Right now, if I had to choose between the two I’d have to go Kershaw. Strasburg could be a question mark for years to come. If Strasburg thorugh finishes a couple of healthy seasons I may change my mind. Strasburg has such a higher level of dominance capability that you’d have to choose that for the longer term, if you were convinced of his health. A follow up question though; are either Kershaw or Strasburg the best young pitcher in baseball? I say maybe not: Felix Hernandez and Clay Buchholz have both put up pretty good seasons in their pre-arbitration years. Guys like Ian Kennedy, Michael Pineda, David Price also put their names in the mix. Boswell says Kershaw, saying he’s “done it.” Fair enough. Q: After Harper’s Arizona Fall League performance, is there any chance he makes the opening day squad if he is the best candidate coming out of spring training? A: There is a chance, if only because Davey Johnson has made a habit of selecting precocious and talented players and sticking with them. Guys like Doc Gooden and Daryl Strawberry. However, the arithmetic penalty for getting Harper into super-2 status by accident is pretty clear; it could cost the team north of $15M. So, my gut says Harper will be left in Harrisburg to tear up AA for a few weeks, move up to Syracuse and join the team in mid June. If he earns it, of course. Boswell agrees with this assessment, then gives up a nugget; apparently Johnson “called up” most of the 9/1 call ups without really conferring with Rizzo, meaning they had to scramble to do the 40-man moves to make it happen. Q: I noticed that the Nats added catcher Jhonatan Solano to their 40-man roster. This seems to indicate that they will trade one of their catchers (most likely Derek Norris) in exchange for a centerfielder. My best guess is Norris, LaRoche (assuming the Nats eat most of his contract), and Marrero to the Rays for Upton. What do you think? A: The Nats added Solano for spare-part cover, nothing more. It indicates nothing about a potential trade, only that they didn’t have another MLB-ready catcher on the 40-man in case Ramos or Flores gets hurt straight away. Norris isn’t ready yet, but is a better prospect than Flores (and possibly than Ramos). I think the trade bait is really Flores. By the way, that trade offer for Upton is awful. The Rays are most likely non-tendering the guy; why would we give up such a haul for him? GMs know the Rays are hamstrung and will wait them out. Just as the Twins should never have traded Ramos, the Nats will be hard pressed to give up Norris. Q: Considering the abysmal state of sports in DC (including, right now, the Caps) is it the time for the Nats to take advantage and go big now? Rizzo’s MO is to fly under the radar on free agency and trades so there’s little that’s going to come from the Nats by way of info. Do you think they might be considering going after some of the big names, such as Pujols or Fielder (and trading LaRoche)? A: Why deviate from the plan now? This team is getting setup for the very long term, generating a ton of rising talent, cost contained, while augmenting where needed with key free agents. LaRoche has zero trade value, so unless you want to waste 1/8th of your payroll you have to use him. I think blowing $200M on either Pujols or Fielder would be shortsighted and would unnecessarily hamstring this franchise going forward. Boswell thinks its a good idea. Edmonds or Sheffield for the Hall? I know it is cliche, and that every baseball writer pens the same article whenever a big name retires. But these opinion pieces are still fun to write and argue about. So argue away. Within the past week, two notable hitters hung up their spikes. Gary Sheffield was forced to admit (much like Barry Bonds, Jermaine Dye and other aging DH-only players quickly being obsoleted in the fast, new, young MLB) that no team would hire him after sitting out all of 2010 and officially filed the paperwork with the league. 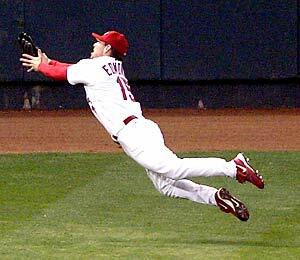 Meanwhile, Jim Edmonds retired from a lingering achilles heel injury that prevented him from suiting up in 2011. For the sake of this article, we will exclude consideration of the fact that Sheffield has admitted to PED/Steroids use and thus probably faces little chance of making the hall. Lets talk about their performances on the field. Sheffield hails from the famous Hillsborough High School in Tampa, which also produced the likes of Dwight Gooden, Carl Everett and (infamously) Elijah Dukes. Sheffield’s career numbers are strong. He retires with a CAREER OPS+ of 140. That’s essentially an entire career of production at the average level of what Ryan Zimmerman gave the Nats last season. He hit more than 500 homers while also having more than 250 stolen bases. He has a career slash line of .292/.393/.514, which is also great. His hall of fame monitor and standard scores (Bill James’ creations that try to measure whether a player is HoF worth) both easily put him in. His closest comparison on baseball-reference is Mel Ott. That’s heady company. Awards: 9 times an all star, 7 times getting MVP votes (a 2nd, two 3rd and a 6th place finish). 5 silver sluggers. Played 3B early, RF middle and LF/DH late in his career. His best season was in 1997, finishing with a ridiculous 189 OPS+ for the Marlins but only finishing 6th in the MVP voting. Beyond the Boxscore printed out an interesting Visual Hall of Fame graphic that essentially shows that Sheffield’s best seasons of his 22-yr career were in the latter part of his career, consistent with a steroids user who was able to beat back the hands of time and not diminish as he aged. In the same way that Bonds did not tail off as he entered his late 30s. Regardless of the steroids, I think he’s a hall of fame player. He was a feared, ferocious hitter who clearly had 5-tools (though not quite at the 5-tool level of someone like Willie Mays or Ken Griffey). He was a game changer who bounced around the league but produced wherever he was. Unfortunately because of a prickly relationship with sports writers and implications in the BALCO scandal, his only chance of entrance will be 30 years from now by a veteran’s committee. 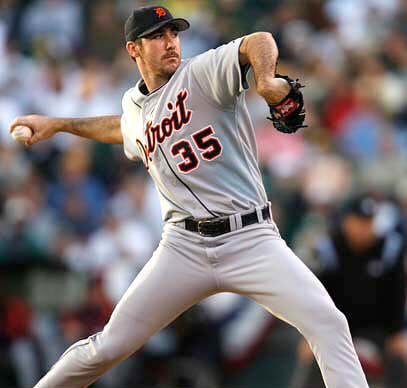 He’ll be on a very busy 2014 hall of fame ballot (other first timers on that ballot include near locks Greg Maddux, Frank Thomas, and Tom Glavine, along with borderline cases Jeff Kent and Mike Mussina). Edmond’s case is less about pure offensive merit but weighing the benefits of a player who can produce at a high offensive level AND provide fantastic defense. Edmond’s career offensive numbers are good but not amazing; in 17 major league seasons he hit 393 homers, had a respectable career slash line of .284/.376/ .527, and a career OPS of 132. Those numbers compare pretty favorably to Sheffield’s career lines when you consider that Edmonds was considered among the best 2-3 outfielders in the game for the middle 10 years of his career. He earned 8 gold gloves for his work in centerfield and has a litany of high-light reel catches to his credit. He was excellent defensively but this did not correlate to raw speed on the base-paths; he retired with only 67 stolen bases for his career, averaging just four a year. His diving catches helped contribute to his demise; he was frequently injured, missed the entirety of 2009 and hung it up because he was not going to be medically cleared to play this year. Career Achievements: 8th in his Rookie voting, 4 time all star, 6 times receiving MVP votes (a 4th and a 5th place vote his best achievements). Bill James’ Hall of Fame metrics are not quite as kind to Edmonds; he falls short in both the Monitor and the Standard. His most similar player comparison is to one Ellis Burks, not really a flattering comparison. Is he a hall of famer? I say “probably.” When grading the defensively minded players (shortstops, catchers and athletic center fielders) you have to balance offensive and defensive. With Edmonds, he’s nearly the hitter of Sheffield with fantastic defense. I’m concerned by the lack of MVP consideration, and lack of all-star selections. If a player isn’t routinely considered among the best players in the game, how can he be a hall of famer? He’ll be on the 2015 ballot along with first timers (and locks) Randy Johnson, Pedro Martinez and John Smoltz. So he may have to wait to get in but he should merit it.